In spite of its grandeur, Recoleta Cemetery is not very large. It is only as big as four city blocks, but more than 4,700 tombs & mausoleums can be found among its narrow walkways. Smaller plots have only one coffin while larger ones can have more than 50. To maintain them all—checking drainage pipes, fixing floors, trimming trees & an endless list of other chores—there are some 65 caretakers… very nice people, passionate about the cemetery & who in several occasions act as guides for the unavoidable tourist who wants to know the quickest way to the tomb of Eva Perón. A simple bit of math reveals that each caretaker has the responsiblity to maintain about 70 tombs, large or small. Not all of those tombs are cleaned or cared for since some families do not pay the corresponding maintenance fee—according to the official Buenos Aires city government website currently 48 pesos or about US$ 12.50 per square meter. Tombs not paid for are neglected by caretakers. The reason, according to one of the cemetery workers, is simple: each caretaker receives as their salary a percentage of what the tomb owner pays to the city government. And in many cases, due to the number of mausoleums in any particular sector which pay no taxes, the money provided to caretakers per month is very little… less than 500 pesos or US$ 130 at the current exchange rate. Some of the biggest vaults, like that of the Familia Leloir, also pay the aguinaldo (a year-end bonus equivalent to one month’s salary) to the city which ends up going to the caretaker. In addition, some families give extra cash directly to the caretaker to ensure better maintenance… a tip of sorts. 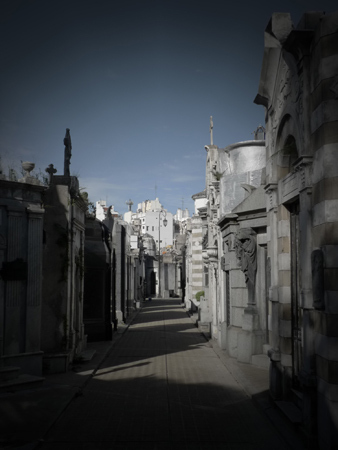 What unites them, as mentioned in the beginning of this post, is their love for Recoleta Cemetery. And their dream, their personal utopia, might just be reaching the status of the most famous caretaker of them all: David Alleno, the only cemetery worker who is buried there. Nunca lo pensé asi pero es verdad… ser cuidador es una oportunidad única para hacer un servicio patriótico. 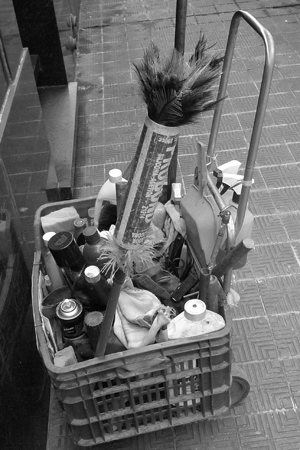 Y conocer a los descendientes de los proceres no tiene precio. Saludos, Nicolas!